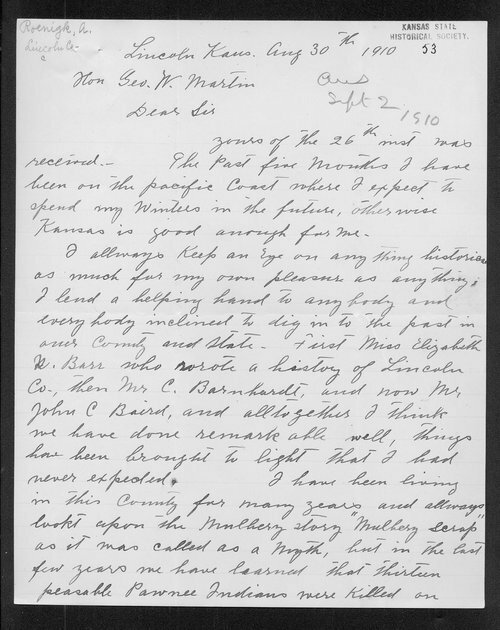 A letter from Adolph Roenigk of Lincoln County, Kansas, to George W. Martin, Kansas State Historical Society, Topeka, Kansas. Roenigk writes of the Pawnee Indians that were killed at Mulberry Creek by settlers and soldiers. He also recounts his correspondence with Hercules Price, who was a participant in the Summit Springs Battle, and how Price had a map of the battlefield and accompanying notes.